We want to say farewell to “Tabi Tabi Po” in style. Join us this Saturday, December 12th, for this incredible show’s closing reception from 6-9pm. Baliktad, a two man team made up of Pu22le (aka Alex Abalos) and Mike Boo (a turntablist not only known in the Bay but around the world), will be filling the gallery with their music. 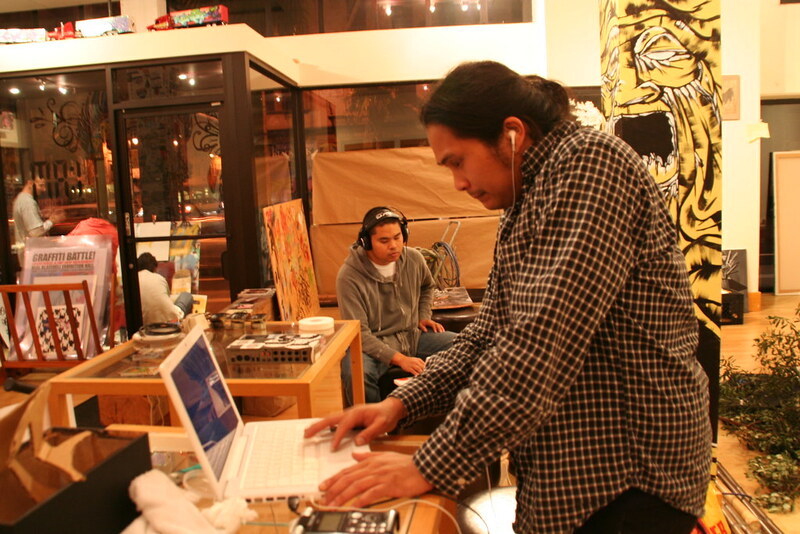 They will be spinning and playing sounds incorporating break beats, traditional Filipino instruments and city noises. Visit our previous post, “Animating Tabi Tabi Po“, for a sampling of their music. Pu22le and Mike Boo making the sounds come alive in the gallery! Salamat (thank you) James for making this happen! It is a truly enjoyable show where people get to experience the richness of Filipino culture and the amazing talents of all the artists that participated. TABI TABI PO CLOSING RECEPTION THIS SATURDAY FROM 6 – 9PM!